At our shoreside celebration on Huahine, one bright gazelle of a female child dashed to and fro, to and fro, leaping to the beat of the drums, infectious joy trailing in her wake. Was she a French local, in from Papeete for Tahiti’s annual gathering of the sailing tribes, the Pearl Regatta? Did she come by way of a long distance cruiser, with parents not satisfied to merely pass through but seizing the opportunity to play sailing games along the way? Did she come from one of the boats in the charter-racing fleet on a one week (and it’s never enough) vacation? No matter. There is a lovely thing that happens when you’re “out there,” and we each take what we can get and make of it what we can. If I had that kid’s energy, I’d hurt myself. But I had my own moments on Huahine. What began 10 years ago as a charter lure for Aussies has become much more. Four days of racing; three days that count for trophies. All the partying you could want, and it’s in the vast Pacific, where dots on the chart mark the very stuff of romance: volcanic peaks worn haggard through the ages, washed by the trades, blissfully warm. The reefs surrounding these islands protect waters as placid as the waters of your local “Lake Placid.” But when you’re there, you are out there, in that vast Pacific. 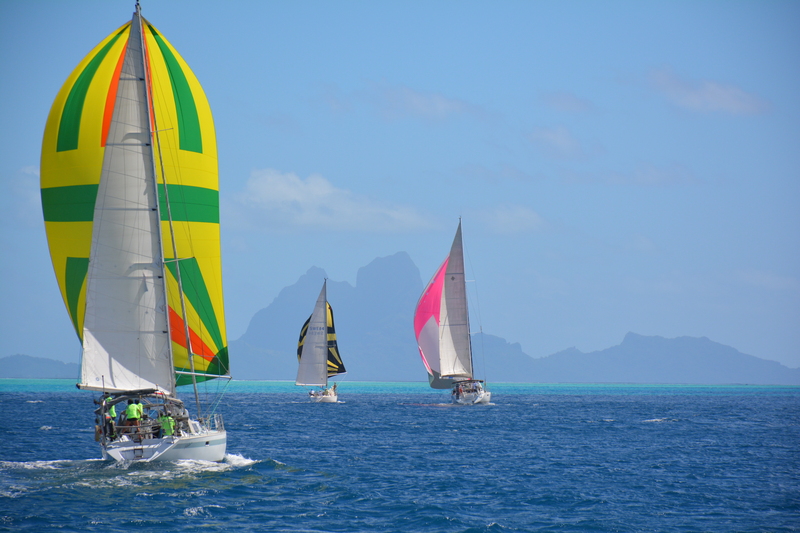 The island of Raiatea, hub of the regional charter industry, was home base for the Tahiti Pearl Regatta, 2015. 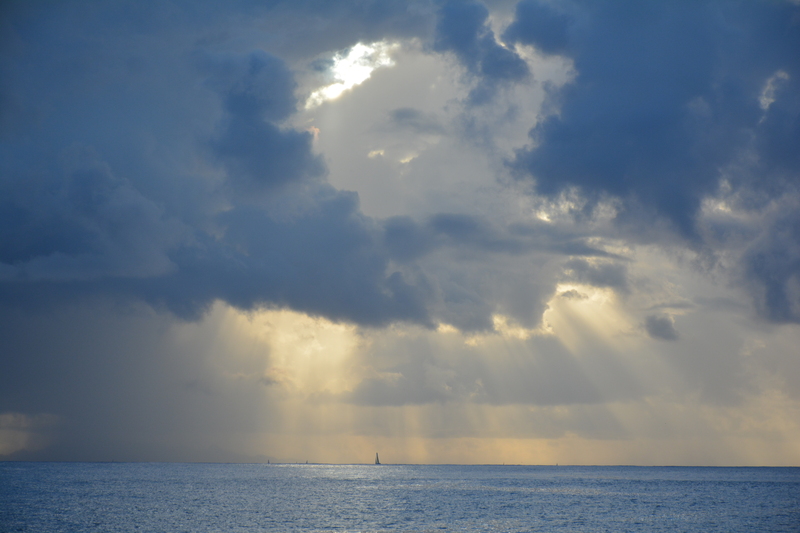 The month was April, autumn in this part of the world, the end of the rainy season and the beginning of the best sailing. Each morning started with a banana race, as the locals call a windward-leeward. Then came something more ambitious. The offering on race day one was a banana followed by a light-air beat from Raiatea to Huahine, a measured distance of 23 miles. And then our celebration on the beach. Race day two served up a banana off Huahine followed by a reach back to Raiatea in a refreshingly fresh breeze—and that sticks in memory. First there was the look of it, Raiatea distant in its own shade of blue, halfway between the blue of the sea and the blue of the sky. A fetching sight. 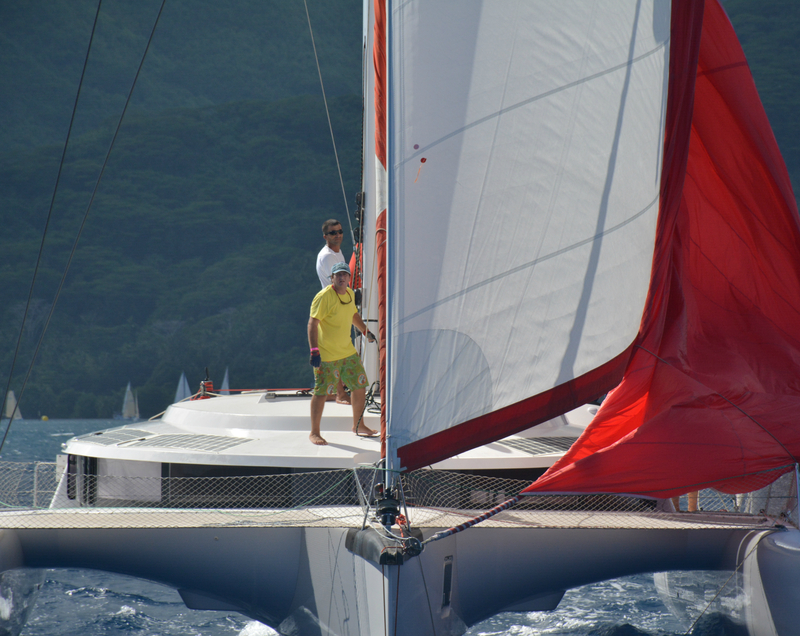 But we didn’t have time to meditate on that aboard Ekolo’Kat, a 34-footer designed by naval architect Nicolas Gruet of Papeete. Nicolas was setting us up to get away ahead of much bigger traffic . 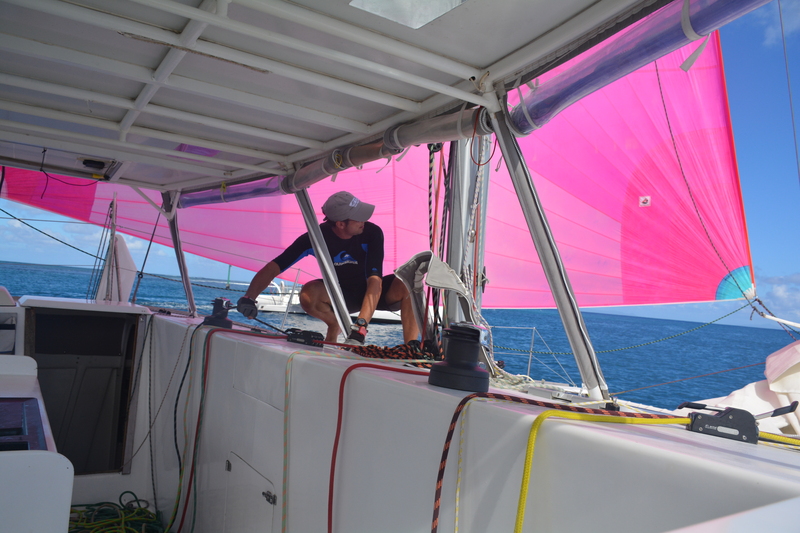 . .
Rafael was scrambling to set the boat’s glow-pink spinnaker . . .
And Benoit was scrambling to wrap the winch for the set. I was scrambling my alleged French, which runs better in lower gears . . . The spinnaker popped, and I snapped a shot of the speedo reading 16.3. We’d later look at 19 and change, but I was a little too busy for shutterbugging, just then. 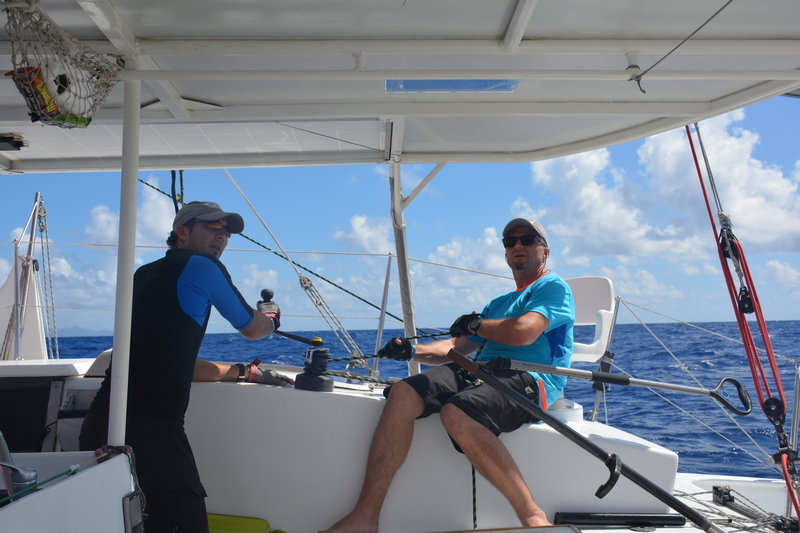 Tactically, there’s not a lot to say about our race from Huahine to Raiatea. We were rockin’. We gybed a few times. It went in a hurry. It was tropical, beautiful, all that gushy stuff. There was nobody in front of us. And having nobody in front of us was all good until, there we were, down the track with the peaks of Raiatea rising fast, and even my French was able to pick out, as phrases flew by, a difference of opinion regarding the passage through the reef. As in, where is it? On the chart, La Passe de Faaroa. The spin was pulling hard, the closing rate was enough to rivet my attention, and that white froth that marks the edge of the open sea was right . . . there. I’m sure you understand, it is good to sail on the sea. It is difficult to sail on the edge of the sea. Yep, that island was getting mighty big. And then, finally, here was Nicolas spotting the markers, red and green: “Oui! Rouge et vert. C’est là.” And in a minute, we were sailing in “Lake Raiatea” with six miles of smooth-water reaching to the finish line and the gun. But if I go on and on about how good that ride was, you might hate me. 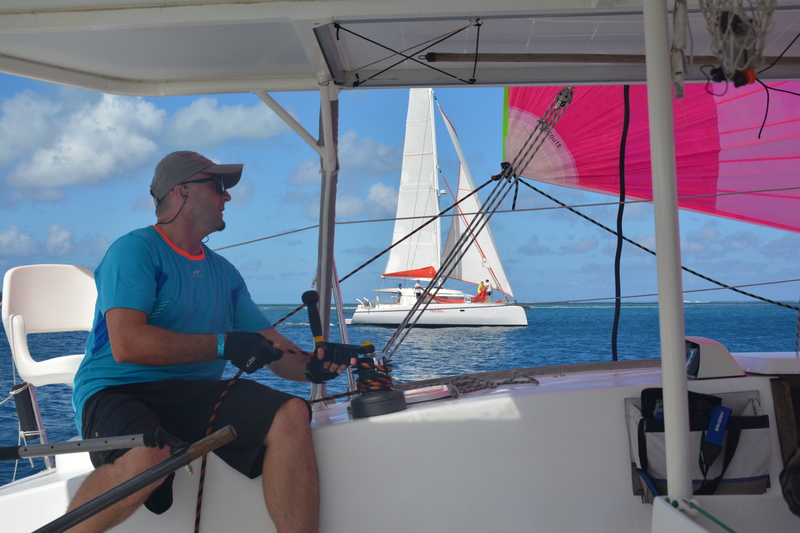 It’s easy to anchor a catamaran in the sandy, sparkling shallows of these islands, tucked up close to the reef. It’s easy under the circumstances of a post-race winning moment to enjoy a libation and a swim in bright, caressing water. But if I go on and on about that, you might hate me. To the voyager, Raiatea is one of the preferred destinations among the Society Islands group that we loosely call Tahiti. Its one village of note, Uturoa, is also the administrative center of Les Isles Sous le Vent, downwind in the trades from the actual island of Tahiti. Uturoa has two boatyards, a market, ATMs that work even if their looks don’t inspire confidence, and a lot less hubbub than the capital on Tahiti, Papeete. Raiatea has pearl farms, beaches, coral and the River Faaroa, the only navigable stream in these steep islands (navigable, but not very far). It also is home to the carved stones of a sacred gathering place, the Marae Taputapuatea. Not just any marae, by its name doubly tapu, or holy, where the first people of the Mauri emerged from the earth. The original Polynesian languages had no B sound, but the English “taboo” derives from the notion that you don’t mess with tapu. Certainly not with Marae Taputapuatea, honored still as a living force, the launching point of Polynesian migration through the Pacific. And likely to touch you in some strange way. The stones have memory, or so it seems. Raiatea also is unique in sharing a lagoon with a sister island, Tahaa, which can be circumnavigated without leaving the lake. Or, we should say, lagoon. 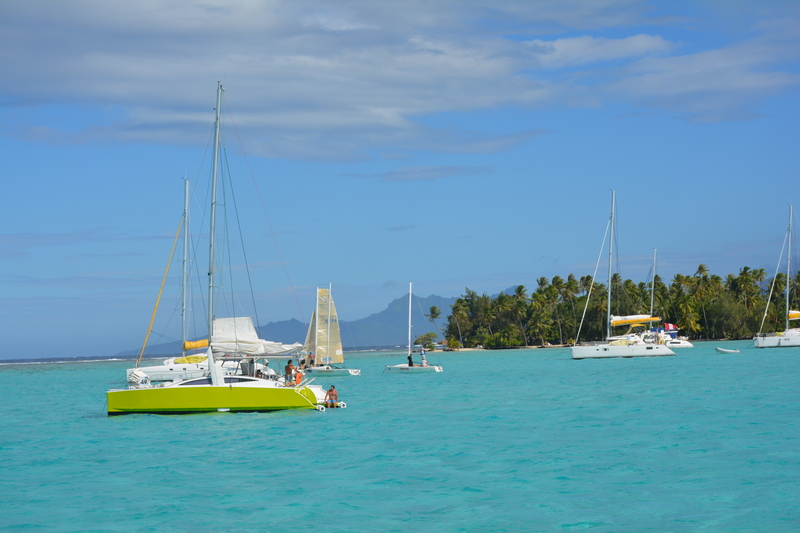 Sailing in the lagoon around Tahaa comes with views of not-so-distant Bora Bora . 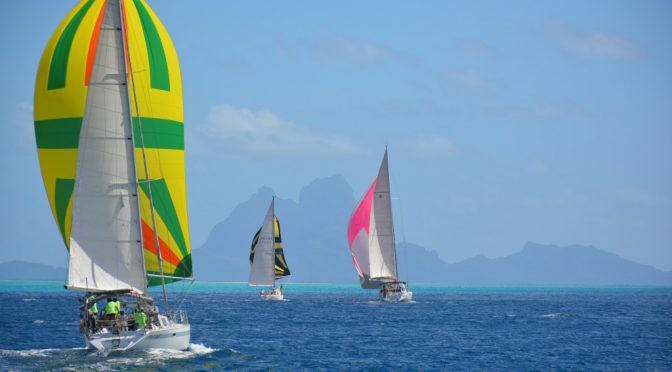 . .
My time aboard a regatta vessel gave me an opportunity to learn that French Polynesia is host to 9,000 charter visitors annually and 800 or so cruising vessels, including some whose owners take advantage of new policies allowing them to extend their stay beyond the standard 90-day visa. For five archipelagos, each very different, 90 days is a rush job. To get the extended visa, you must apply ahead of time, in person, at a French consulate or embassy, and the process takes two weeks. But you can expect to be welcomed if you have a clean record and a financial status that makes you worth having around. I don’t know what sins my forefathers committed to keep me from racing on the final day, but everything had gone pear-shaped early. All along I had admired a quick, smart looking XP-44 named GarliX that was one of a half dozen Tahiti Pearl participants cruising through as part of the World ARC rally. It was great news when Jens and Dagmar Garlin invited me along on GarliX, but then we proved what a headache it can be to leave a bow-to Med mooring in a crosswind. Outside assistance was employed, warps were deployed, and I don’t know what we could have done better besides calling the whole thing off, but we managed to wrap the prop and mangle items replaceable only through X-Yachts in Denmark. The loud thwump was sickening. Dagmar when I came aboard had apologized for her English, even though it was perfectly fine: “We grew up in East Germany,” she said, “We were taught Russian, not English.” Now both Dagmar and Jens wanted to apologize for sabotaging my race day, while I tried to assure them that I’ve been around this sailing thing long enough to know that “it” happens, and we know what “it” is and really, I feel bad for you. It was heartening, weeks on, to check the rally web site and see GarliX in company with the rally fleet in Vava’u, Tonga. As this goes online, the rally fleet is in the Indian Ocean, in the Keelings. All is well. Trials come and go. It’s the cruising life. Most of us are familiar with the ritual coming together of helping hands around a stricken vessel, and most of us know the Water Rat’s compelling spiel on the joys of messing about in boats, simply messing, but we too often forget the most cogent point of that story. Which is: The Water Rat runs aground. The Water Rat crashes down to the bottom of his little boat, heels to the sky. And the Water Rat misses not a beat about simply messing: ‘About in boats—or WITH boats,’ the Rat went on composedly, picking himself up with a pleasant laugh. So the regatta was done. The rally went on composedly. In the wake that GarliX and fellow travelers left behind, other voyagers will now be exploring the lagoon of Raiatea-Tahaa. Reflections from the sandy shallows will pose the question, who turned the lights on? 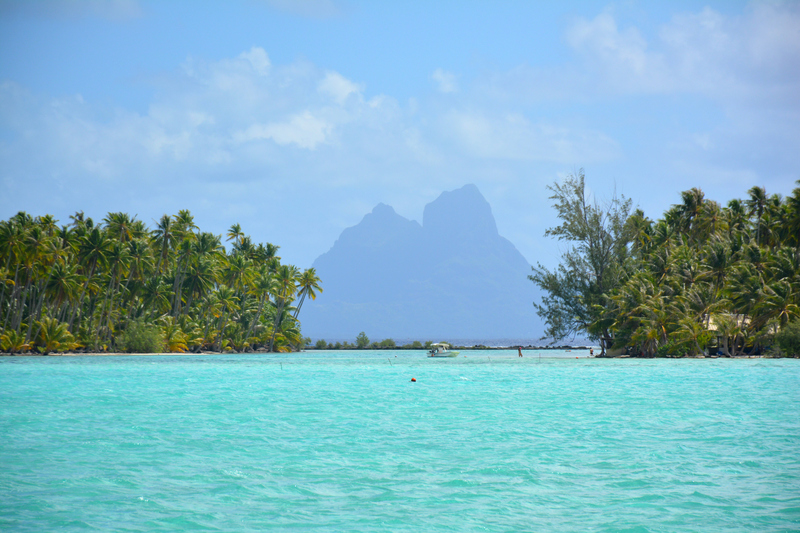 Bora Bora will beckon, half a day’s sail beyond the lagoon, beyond the reef.